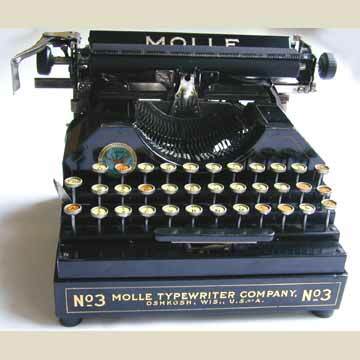 The Molle 3 (there is no Molle 1 or 2) was the invention of jeweller and watch maker John Molle. The story of this machine is one of the sad stories in typewriter history. The Molle 3 is a pleasant and light machine, that was obviously produced for easy repairs. John Molle repaired watches and typewriters, and his design for a typewriter was clearly influenced by his experiences as a repairman. His prime source of both inspiration and frustration could have been the Smith Premier typewriter. The SP was one of the best typewriters built, but a disaster to repair without special tools. Like the Smith Premier, the mechanism of the Molle worked with a set of rods and levers. But any attempt to repair or replace one of the rods on the Smith Premier was doomed to fail. Two screws on the keyboard were all that was needed to make the entire system fall apart. The Molle could be split up in three sections (carriage, keyboard/type-basket and frame) within one minute. And within this one minute each and every part of the machine was brought in plain view, for cleaning or replacing. Apart from ease of repair, the machine had a carriage that ran on ball bearings (see pic 4), and that could be removed by simply loosening the righ margin stop screw. Only about 11,000 of these machines are thought to have been built. Several dozens have been traced to private collections. See the book TYPEWRITER, page 188.